Heading out for a fun day of camp! From cargo bikes laden with young children, to parents and kids on their own bikes, the popularity of biking is growing in Marin and nationwide. This is something to celebrate! The health benefits of biking are numerous, and consuming less gas gives the earth a little extra breathing room. As cyclists and owners of Fairfax Cycling Camp, we are happy to share some tips and resources to help you bike more safely with your child. We teach our campers these skills every week during our summer mountain bike camp. 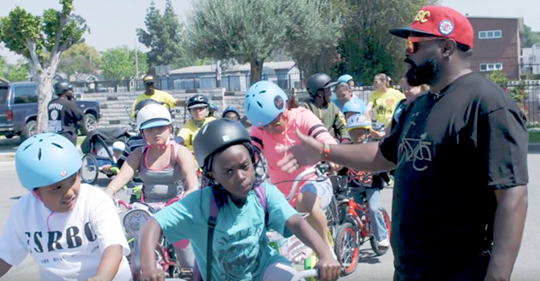 Helmets are required by law for all children under 16 in California. Helmets protect your child’s developing brain from trauma which could come from even a seemingly small bump. Just like on an airplane when you are told to secure your own oxygen mask prior to helping another, make sure your helmet is on properly before biking with your child. This does two things; first, you are protecting your brain and doing your best to make sure you’ll be around to take care of your child in the event of an accident; second, you are modeling appropriate behavior for your child. Research consistently shows that children learn by watching what the adults around them are doing. You are setting an example for your child, one that you hope they will follow long after they’ve begun riding on their own. Please, wear your helmet, and make sure your child does too. Check out our blog to see a great photo showing how to properly fit a helmet. Also, watch this fun video with your child, brought to you by the Province of Manitoba. Talk with your child about the rules of the road before you ride, and make sure they stop at all stop signs looking both ways, staying on the right side of the road. When riding with your little one, have them ride in front of you. That way, you can keep an eye on them to see how they are riding and what they need help with. Avoid “the door zone” by leaving enough room between you and any parked car, as the door may swing open without warning. Pick a line. Safe cyclists pick a relatively straight line and try to stick to it. This makes the rider more predictable for cars and other cyclists. Get that bike tuned up! Kids have been known to crash due to their bike not being properly maintained. Bikes have lots of moving parts which need regular maintenance! Check out Marin County Bike Coalition’s Safe Routes to Schools Program for more information on biking safely with your child/ren!